A: We will try to do a different kind of interview, with a variety of topics. A: Is an artist the same person on stage as in everyday life? PJ: Not exactly, it’s a mix between the stage and your character, the role you’re playing and your own sensitivity, but the audience feels as if the artist also puts a part of himself, of his personality into his interpretation and appreciates that. Playing a role also makes you discover things about yourself; being on stage transforms you. It changes you in the eyes of the spectators, you are the most important one in the spotlight, in the eyes of others you are no longer a normal individual. The audience wants you to be ‘extra-ordinary’. However, it’s important to keep your personality – the essence of an artist. A: After the last performance of this opera, you will take a long break. I think it’s a privilege to have a job that is a passion, we never stop. However, I also have the chance to have tours planned – two, three, even four years in advance. This way, I can plan a break knowing that I will have work to do when I come back. It is important for me, this break. I will not stop singing for three months; it will only be weeks, or one month, and then I will work on new projects that are important. A: How would you describe the experience of Only The Sound Remains at the Teatro Real in Madrid? PJ: It’s a unique opportunity, performing a contemporary opera created especially for my voice; it’s really something special. 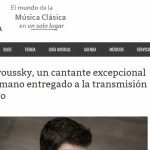 I know that a countertenor can sing a greater variety of works than the repertoire for castrati – that’s why contemporary music seems important to me. Recently, I thought, if I think of my future self, thirty years from now, alive or dead, what will remain of my career in the people’s memory? What is it they are going to remember? Of course, they will remember me as a specialist when it comes to Baroque music, but this contemporary work will remain an equally important moment in my career. For me, Kaija approaches the genius of a Monteverdi when it comes to her way of composing, her connection to the text. To keep this fluidity because the text is in English, … Recently, I worked with some great directors. Before, I did quite a few operas, and it scared me. I could work with Peter Sellars for Theodora, and recently with Robert Carsen. In fact, I imagine working again with Peter Sellars in the future, maybe not a contemporary work, may be a Handel opera. To me, Peter Sellars is somewhere in between a singer and a director. A: Are you Russian? do you like Russian music? P My grandfather was Russian, So only my last name is Russian. But in fact, I have always liked Russian musicians, like Shostakovitch and Prokofiev, when I was about 17 years old. I’m not planning to sing in Russian though; maybe in the future. I know I have a “joy” personality, but I also like slow arias, melancholic music, more than dramatic or hysterical music. A: George Bertrand was your teacher? P: Yes, when I was ten years old, he told my parents that I had to learn music. So I studied at the conservatory of my city, first violin, later piano. I have always had a complex, because I started to study music too late (ten years). Everybody said that I had started too late, that I would not be able to do it. (Maybe that is the reason why I founded the academy.) However, when I started singing at 18, … Everybody said I was too young! I had a good notion of high notes, possibly because of my training with the violin. At 18, I started studying with my professor. Since 22 years ago, I always see her; she is my second mother (laughs). At the beginning, my voice was too flexible (metralleta) now I try to work with the lyrics. A: How is your relation to Cecilia Bartoli? P: I have a deep admiration for her. We have a deep connection. Even if we don’t see each other so frequently, we have a musical connection and we have the same understanding of “work” Cecilia managed to have a very natural contact with public. I met her when I was 21 years old. I was still a student. I had been standing in line for an hour and a half with a disc to ask her to sign. 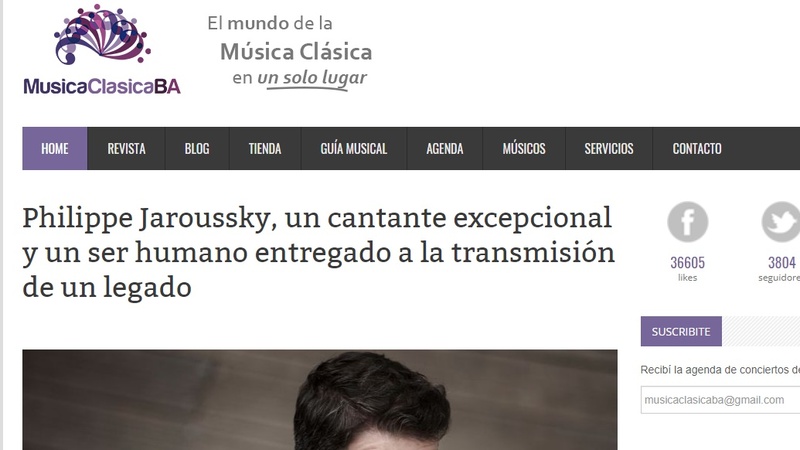 When I was in front or her, I began to say that she was an example for me, and she stare her eyes on my eyes for a while, and she realized I was a student, and she wrote for me a complete sentence “For Philippe Jaroussky, future success in your life…,” and like this. I told her this 15 year later. When sometimes I am tired, signing, I always remember this moment of generosity with the audience. PJ: He is special for me. I had to read him at school when I was ten, eleven years. It was my first emotion that I encountered in poetry. That’s why I did the project I had have with Verlaine. A: Do you think about another project with poetry? P: Not, no with poetry, but yes, in French language. P: “The Music Teacher” is very important because it is about the difficulties of “not belonging to a certain world”. There is a new student; he was not from the right class and is difficult for him to insert himself into that new world. I come from a middle class family; it was difficult for my family to buy the instruments that were expensive ones. That is why I have founded the Academy, to help children with no possibilities. About “Farinelli”: It is the story of the most famous castrato. He was a god on stage, but in the real life, he didn’t have a complete life. When I watched “Farinelli” at the cinema with a friend, I told her I didn’t like it. I was still studying violin, so I was used to listen to a different kind of music. But I didn’t know that a few years later I would be singing this music. So, musical tastes change. A: How do you see France nowadays? P: I think France is in a kind of an awakened stake. I’m thinking about projects with children, about a new generation. I see that little by little, young people are getting tired of social networks. They have been with mobile phones all time since they were children, and now, at 20, 21, they are beginning to feel tired of that. A: Do you think about writing a book about your experiences? PJ: No, because now I want to dedicate a lot of time to the academy. I learn so much myself teaching in the academy. If one day I write a book, it would not be only of my life, but principally about music, so that it would be useful for other people. Maybe I would write in 10/15 years. A: What about your dreams? PJ: I am dreaming. For example, I have projects concerning conducting orchestras, with a first work in 2022. A: Can you tell us where? A: What about your career? I am 40 years old. It is an important moment; is a fantastic age. And all these years, I have lived a very intense life, so many travels, successes, meetings with great people…I think that from now on, my life is a bonus. If I die tomorrow, I will know that I have had a privileged life. A: Do you want to tell us something important? P: Yes. Related to the “bonus.” Until a short time ago, I have had a very simple relation with success. When people talked to me after concerts, I used to listen them, but with a distance about that success they speak about, like, the important thing was the music, not me. Now however, I can accept these things in a more intense way. If people say “your singing is important to my life,” I listen to them with more attention. In “Only the Sounds Remains,” in the second part, at one time, I have to wait 15 minutes. And so, I try to enjoy for example, to be in the same place I was 18 years before for the first time. I was on that same stage, and I enjoy this, not create limits. And all these feelings, I want to memorize them. A: Are you thinking of going to South America? PJ: I have been in Buenos Aires twice, at the Teatro Colón, and I know I will return to Argentina again, not too far in the future. I think that two years from now, I will be at the Teatro Colón de Buenos Aires four times, and two times in Santiago de Chile.